Cabin style beds for the younger generation. 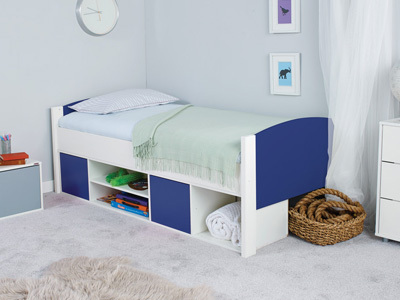 Choose from a range of under bed storage configurations to keep all the toys neatly tidied away. Constructed from wood and available in a range of natural or painted finishes. Need to release the inner pirate within your child? Maybe you have the next Captain Hook living under your roof. Treat them to a brilliant, yet convenient new cabin bed! Cabin beds serve a similar function to mid sleeper beds. The main difference is that cabin beds are usually lower in height, which makes them perfect for younger children who aren’t quite ready to take the big step into a single bed. 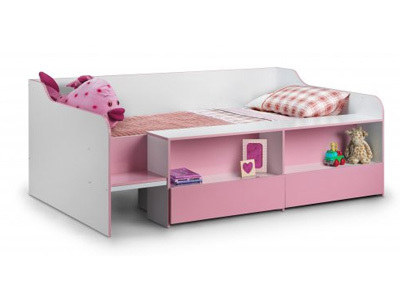 If you are looking for a child’s bed with extra storage capabilities, then a children’s cabin bed is the perfect product for you. The storage area under the bed is usually made up of a selection of cupboards, shelves and drawers that give maximum use of the space provided. All of our cabin beds are made from wood or metal, providing complete support for your children as they sleep soundly through the night. You can be sure all our beds are high quality and each come with a comprehensive manufacturer’s warranty. The main difference between acabin bed and a captains bed is that a captain’s bed will only have a selection of storage drawers underneath the sleeping area. Some captain’s beds like the Amani Sleepover Captains Bed have false drawers built into the side of the bed to cleverly disguise a pull-out bed that is stored under the main bed. If you are looking for an extra bed for sleepovers, then a captain’s bed might well be the perfect product for you. Our selection of cabin beds come as a frame only and will be delivered to you flat packed. Mattresses are available for all of our cabin beds as an optional extra and we have suitable mattresses to cover all budgets and comfort requirements.